On "The Doctor's" TV show we perform a Stem Cell Therapy treatment for plantar fascitiis relief before a live studio audience. Stem cell therapy is one of several amazing medical technologies which use the healing power of ones own body to repair itself. This state-of-the-art regenerative treatment has become successful non-surgical options for our patients suffering from a number of painful foot and ankle conditions. Stem cell injections may be used to successfully treat patients with degenerative arthritis, tendon and ligament damage. The injections can offer pain relief and prompt tissue regeneration. The procedure is virtually pain-free as our doctors first acquire some of the patient’s own stem cells by collecting a blood sample from a selected part of the body. 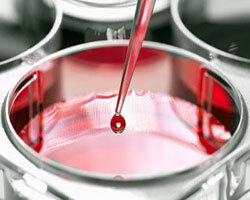 The procedure allows our doctors to customize the stem cell specimens for your particular injury. The patient's own stem cells are then injected into the injured area of the foot or ankle, where they almost immediately begin to multiply and flourish. Stem cells have been found to replicate themselves and nearby cells begin to mimic them making healing possible and producing an anti-inflammatory effect that can help reduce pain. Additionally, stem cells injections contain hyaluronic acid, which lubricates joints and tendons, easing pain and helping restore mobility. The University Foot and Ankle Institute stem cell treatment is well tolerated, many patients claim it is not painful at all. University Foot and Ankle is now using amniotic stem cells in stem cell therapy of the foot and ankle. For orthopedic patients amniotic cells are useful for cartilage, tendon and ligament injuries. This very exciting advance for foot and ankle treatment is different than traditional stem cell therapy because the cells are taken from amniotic fluid, which is extremely high in stem cell concentration and consists of extra-cellular matrix (ECM). The ECM, which is not present in PRP, is especially useful for cell migration and attachment and signals the body's own local cells to assist in the repair process. The use of amniotic cells has been regulated by the FDA since 2003 and is considered safe and non-controversial since it is harvest at the time of caesarian section. These ultra-concentrated stem cells are sterilized, tested for efficacy and then frozen for a very short time while being transported to us. Then it is simply injected into the damaged area, the same as traditional stem cell treatments are. UFAI has been a part of the research in this advance for a number of years and the finding thus far is this technique is very powerful for the right patient population for their healing. As an example, Kobe Bryant of the Los Angeles Lakers recently had this procedure performed as part of his Achilles tendon surgery and recovery. Preliminary evidence shows that it not only significantly helped his Achilles tendon tear recovery but also helped with the healing of the surrounding bone, fascia, ligaments and tendons. At UFAI we firmly believe most conditions should initially be treated non-surgically and with minimally invasive techniques. These “conservative treatments” typically deliver excellent results over 80% of the time. This conservative care approach is also considered the most cost-effective for the patient as well. Occasionally, when conservative treatments do not work as well expected, other advanced non-invasive treatments become necessary. Regenerative treatments such as stem cell therapy, Platelet-Rich Plasma (PRP) or Prolotherapy (type of treatment depends on the nature of your injury) are exceptional options offered by the University Foot and Ankle Institute. Our physicians have decades of combined experience using regenerative medicine and internationally recognized experts in its use to treat foot and ankle conditions. Q: I would like to know how long should one rest after stem cell injection for planter fasciitis. Can I resume my daily walking routine immediately? A: Usually we use a boot to rest the area and allow healing for 2 weeks. After the rest period a slow return to activity can resume over the next two weeks. Q: I have been suffering from Achilles tendonosis for months and PT and other conservative treatments aren’t working. I’m in interested in stem cell therapy but would like to know how many injections are usually needed? A: Like platelet rich plasma (PRP) Therapy, stem cell therapy usually requires two injections.